Shane is back! The beloved heroine of students and faculty alike returns in this third volume of the acclaimed series, focusing on the basic how-to’s and foundations of ethnographic studies of children and childhoods. The book opens with Shane trying to land a post-doc working in a department of cultural anthropologists studying children and childhood. Rather predictably, Shane initially sees children as nothing more than small adults. But in this book she’ll be forced to reorient herself, yet again. As usual, she is aided by the spirits of the ancestors, of senior colleagues, of talking guinea pigs and gigantic head lice, and through it all by her esteemed guide, Billy the Literal Kid. 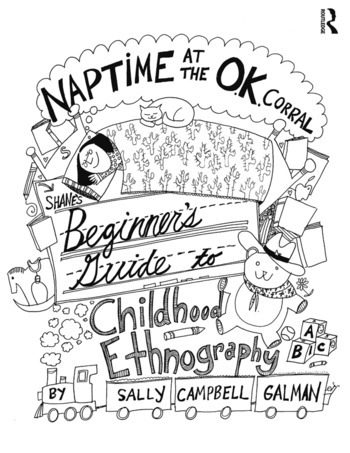 This illustrated guide will orient the reader to the fundamental challenges in doing ethnographic research with children. The book begins by briefly exploring the history of research on children, with children, for children and "by" children. Throughout, it is about doing research with children rather than on them, highlighting their participant rather than object nature. Chapter 2. Little Britches: "What is a Child?" Sally Campbell Galman is Professor of Child and Family Studies at the University of Massachusetts, Amherst College of Education. You can read more about her research, writing and art at www.sallycampbellgalman.com.